A taste of Ruritania for Tradgardmastare. A regiment in the style of Charge! Aunty dearest, may I have a medal? Ruritania and the Hapsburg domains. Note the Swartzkrag mountains in the blackground. Aquatint by Mikail Patrickson 1836. Ruritania was once described by Count Metternich, during the Council of Vienna in 1815, as "…a model of good government, the pinnacle of enlightened absolutism and an ornament to the world". Though briefly a republic after French invasion, the idea was so unpopular that the populace revolted in support of their King with "God and King Michael and Death to the French!" as their rallying cry. Imposed from without, the short lived Republic of Hentzau stood little chance and soured the Ruritanians on the idea for a generation. Many radicals have bitterly regretted their collaboration with the French, arguing that "…eighteen months of French bayonets accomplished what hundreds of years of despotic misrule could not; a popular Elphberg." Ruritania is ruled by a hereditary monarch and the reigning House of Elphberg was established in 1453, after a ten year long series of internecine conflicts known as "The Wars of the Cups". Rudolph Elphberg, later Rudolph the First of Ruritania (also Red Rudolph), smashed the army of his rival Constantine Brunchkli, at the decisive battle of Swartzkrag. Thereafter he marched on Streslau where he was eventually crowned King by the Arch-Bishop of that city. At the time, it was an event of such importance that the Holy Roman Emperor was in attendance. While the hostility between Austria and Ruritania is a product of many factors, mainly geographical. It is said that the historic antipathy between the two dates from an incident at the coronation. As the newly crowned King was processing down the nave of the Cathedral, the Emperor stepped on the hem of his train, tearing it. The King famously set his dog (traditionally a Tekkel, though there is great debate on this point) on the Emperor with the words, "Small, though I may be (he was noted for his slightness), but I'll not suffer a fat man to tear something from me, but that he'll feel my teeth." The Elphbergs, have with a few interruptions, ruled ever since. Immediately beneath the King is the Assembly, which is made up of two parts, the Cabinet of Roses and the Diet. The Cabinet of Roses, which is so named because it meets in the Rose garden of the Palace at Streslau, is appointed by the King, while the Diet is made up of all those men over 21 who hold patents of nobility. While the King is in theory, an absolute monarch anointed by God Almighty to rule Ruritania as he sees fit, a great deal of power rests with the cabinet. While the cabinet cannot actually overrule the King, it is virtually unheard of for a King to go against the advice of the Roses, if they are in complete agreement. The Roses are generally at their most powerful at the beginning of a King's reign, their influence waning as he reaches maturity as a monarch and then waxing again as he becomes older and less capable. These periods of power are known as "first bloom, the falling of the petals and the second bloom". - The First Lord of the Privy Chamber. - The Second Lord of the Privy Chamber. - Secretary of the Privy Chamber. Additional members may be added, but the Roses rarely exceeds ten and has never exceeded twelve members. With the exception of the Cardinal, the King's Confressor and the Master of Music, all the Roses must be eligible for entry in the Diet, that is, must hold patents of nobility. The only other exception to this rule is the Marshall of the Army, who has twice, once in 1742 and again in 1780, been a commoner. The Chancellor of the Treasury is probably the most powerful position, controlling as he does the Kingdom's finances, as well as being responsible for public buildings, tax collection, sewerage and roads. He is a man of many secretaries. The First and Second Lord of the Privy Chamber are the two senior members of the Diet, the Dukes of Hentzau and Zenda, respectively. It is not unusual for these men to be amongst the first and most able nobles of the land, so that they may act as a check on the reigning monarch, as neither man would see the King alienate a kingdom that he has substantial holdings in. The Secretary of the Privy Chamber keeps the minutes of the Cabinet meetings and is usually a favourite of the King's as he may appoint whomsoever he wishes to the post. It is a highly sought after post. The titles of the First and Second Lords and the Secretary refer to the previous Cabinet, known as the Privy Chamber which was incorporated into the Cabinet of Roses by King Rudolph II in 1690. King Rudolph felt the Chamber was exerting too much influence and wished to dilute it by appointing more members. A common tactic of the members of the Privy Chamber, was filibustering, deliberate time wasting that deeply irked the King and prevented any actual work being done. Rudolph retaliated by relocating the Cabinet from the Privy Chamber to the Rose Garden of the Palace in Streslau where members were required to sit, regardless of the weather, until the King has dismissed them. After a particularly rainy summer, two Lords of the Privy Chamber were carried off by chills, and Ludwig achieved the more congenial Cabinet he was after. While both the Royal Confessor and the Cardinal-Protector are members of the Roses, by courtesy it is traditional that only one be present at any particular meeting. Experienced courtiers use their presence or absence to gauge the King's attitude towards Rome and indirectly towards Austria. It is thought that the Confessor, being a Ruritanian, will be more sympathetic to the King, while the Cardinal, who is an outsider, will inevitably try to talk the King out of hostile acts against the old enemy. Since the reign of Christian III ("The Wise"), who was taught in his youth by a Spanish Jesuit, Carlo Mario Martini, the King's Confessor has always been of the that order, which has sometimes excited to the disaprobation of Rome. The Master of the Music is the only member of the Cabinet required to be a commoner. Music has always been considered the foremost of the Arts in Ruritania and the Master of Music is simply the King's favourite composer or musician. Much like the King's Fool in medieval times, the Master of Music is granted great licence to speak candidly to the King. As such, he is considered to be the voice of the common people and is often approached to present petitions to the King. The Diet is a mere appendix, the King is not required to call it and usually only does so once a year, when all are present in Streslau for the celebration of Easter. The Diet votes to approve laws and taxs, though the King is not bound by their decision. However, it is an unwise monarch that angers the Diet, and while there is always tension between the Palace and the Hall (the Diet meets in the Hall of St. Stephen in Streslau), relations are usually kept civil. The only powers that the Diet has that are denied to the King are the powers to issue patents of nobility or to reassign the titles or lands of the Diet without its consent. I spent a very pleasant weekend mainly in the company of my wife. Mrs. Kinch is back in employment again, after a quietness in the theatrical line, and blessed be the day. Mrs. Kinch is a great deal more tractable when she has an occupation. Not much painting was done over the weekend, but I did make a decent fist of the remainder of my first Charge! regiment. All bar the Chef de Brigade are finished. Considering how fond I am of the mounted arm, you would think that I would enjoy painting horses, but sadly it is not so. I've been doing my first piece of writing for a span and finally had the break that I needed on Saturday. Send out for the shopping, I dawdled for half an hour on my way back reading Kipling online in a cyber cafe and trying to eavesdrop on the Indian proprietor. I think I am beginning to get a whiff of English as it is spoken on the sub-continent. There seem to be a lot of short sentences, but long multi-syllabic words. Hearing an Irish policeman hailed by an Indian businessman with, "Ah Pascal, what is the story"* in the tones of Dublin by way of Bombay says more about the changes in Irish society in the last ten years than any amount of news print. Still I got what I needed and the first draft is done. I'll put it up here when it's done. While I was writing the story, I came across some notes for Ruritania. I've been neglecting Ruritania. I should do some more work on it or at least type up those notes. I've been thinking about changing the name. When I was writing it at first Ruritania was a useful handle, but I think its begun to outgrow it. I have a very strong idea of who the Ruritanians are, a proud, churchy, musical people; poor but respectable, parochial, but not overly chauvinistic. Keonig und Kirk und Kinder. The K and K and K of Ruritanian life, King, Church and Family. It probably doesn't work in German, but I know what I mean. Georgia was on my mind, so I thought about renaming Ruritania after a Saint. Pretoria has a nice ring to it, but it has unpleasant associations. I always hear it in the voice of Rhodesian friend of mine, the purring R and the soft T of his not quite English, not quite South African accent. He was a Rhodesian; he was NOT from Zimbabwe. Despite his support for an appalling regime, he was by most measures a sterling fellow and an excellent dinner companion. He came to Ireland immediately after the end of the Smith government and worked as a hydrologist. I always imagined him dying here and being buried in a lonely way, like the White Russians in the Non Catholic cemetary in Rome, but he moved to South Africa last year. However much he said he hated majority rule, I think he missed Africa more. What other Saints are an option? Boniface? Hippolytus? Michael? It's got to sound good with -ania, -ovia or a similar suffix. The Regiment (name to follow) in line of battle. I mustered my first regiment according to the regulations laid down by Lawford & Young last night. Much remains to be done, but they made a fine sight even partially assembled. The authors mark the pioneers and vivandieres as being optional, but to be honest leaving them out would mar the pleasant sensation of completeness that watching them march along, with all the panoply of a regiment on the road, brings. Recruits for the as-yet-unnamed-regiment. Left to right. Top hatted chap in greatcoat. A selection of Les Filles de la Regiments. Two of these figures broke at the ankles in transit, so I gave them long skirts with greenstuff. Lastly a converted pioneer. 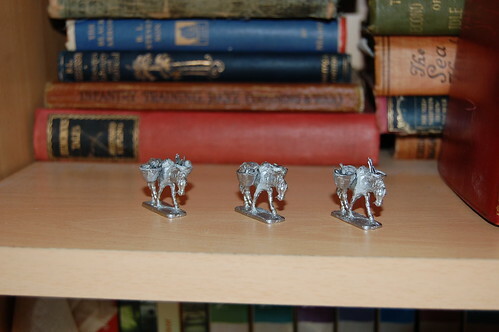 Pack animals and vivandiere's were purchased from Uwe Ehmke and they've arrived. 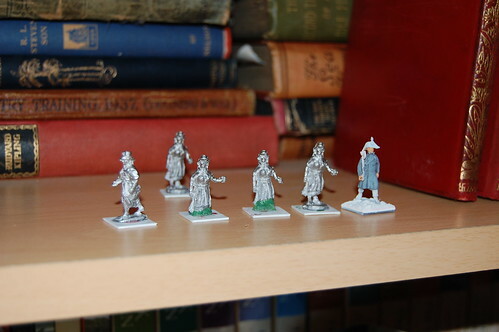 The pack that I bought from Uwe had a chap in a top hat and a long coat, that I actually think might make a better vivandiere than the lady also included in the pack, so I'll see if I can't turn him into a lady with a judicious paint conversion. Who would really see a female figure underneath that great coat anyway? The ladies will be painted up in the rather more drab garb of peasent women. Uwe's figures are very pleasant castings, hand poured with the flash that that brings, but very serviceable for all that. I reserve judgement until I've actually painted them. You can find Uwe's figures here or if you'd like to communicate with the chap himself, drop me a line and I'll put him in touch with you. 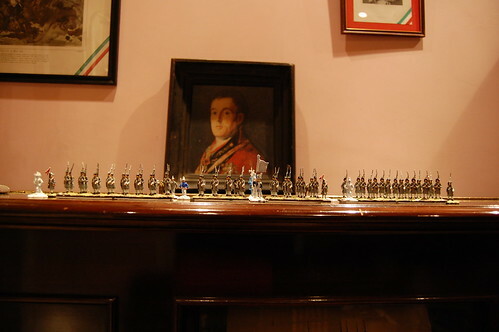 Shavetails of the Regiment. Figures by Uwe Ehmke. Vital parts of the regiment remain unpainted of course, but I'm almost there. Since all the rank and file are marching, I decided that all the other personnel would have to fit in with that look, so out went the sword waving officers from HAT's Greatcoated French Infantry 1805 to be replaced with the marching officer from their French Infantry 1808-1812. The pioneers I put together by swapping the head of an officer from Greatcoated French Infantry 1805 on the body of a marching Young Guard from the HAT set of the same name. Add an axe from Italeri's Medieval Tournament set et viola; you have a gallant smasher of barricades and builder of scaling ladders. In retrospect, for the look of thing (the RSM and the Ensign that I have both sport bearskins), I should probably have used a bearded head with a bearskin, but I'll know for next time. I'm sure there are historical problems with the regiment, in terms of colour of epaulettes and so forth, but I find reading Charge! is a delightful antidote to that sort of thing. I might delve a little deeper into the matter in time, but I won't lose any sleep over it. The commanding officer is a shako'ed chap from Italeri's French Imperial Staff with a head swap from a Prussian trooper in their Allied Staff set. I would have used an officer's head from the Greatcoated French, but it didn't seem to match, so I went hunting elsewhere for bicornes. I've never been any good at conversions before, but since attempting my first few, the practice seems less intimidating and more rewarding then expending time and energy searching for exactly the right figure elsewhere. Mrs. Kinch was at bell ringing and choir, so I had the whole evening to get the bit between my teeth and a very pleasant evening it was too*. Thank God things are beginning to settle down at last. *I recommend Chesterton and Conrad as painting and converting companions of the first water. 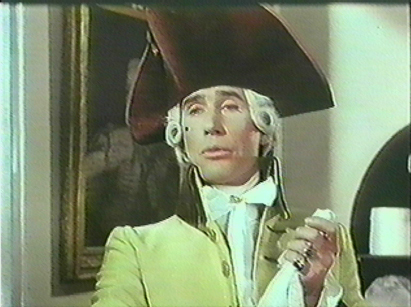 as active service lead to slackness in one's cravat. I came across this the other day and it was too funny not to share. Lord Dunkellin was on active service in Persia at the time this letter was written. One of his duties there was to send regular reports to his uncle, Lord Canning. When he had no military or diplomatic intelligence to offer, he wrote to his aunt instead. Lord Dunkellin to Lady Canning (his aunt) on the 16th December, 1856. "I dedicate this despatch to you, as nothing of any material importance has occurred since I wrote to Uncle. C. so I will not obtrude myself on his time. We are getting on very well tho' the excitement of fighting and the new location being over, we are rapidly relapsing into the monotony of camp life. I have got a very good tent thanks to the General who is the best natured old man in the world, and having more than one of his own, has lent me a jolly Bengal Hill tent. It is much more convenient being on shore than living on board ship, as I am in the middle of everything and can see & hear what is going on much better than if I were afloat, besides at any rate here I am fixed, & feeling certain of my wherabouts, whereas I might be shifted from ship to ship according to the vacillating fancy of the Admiral in a most unpleasent manner. I hear that the General has sent in a flourishing account of our march & capture of Bushire, & I am certain the Admiral has done the same. Many here, especially the young ones, are anxiously speculating on the chances of having a medal given for the business. If there be one granted from India do you choose the ribbon, and take care to let us have a pretty one that will look well on red & blue coats...I think a white rubbon with crimson edges** wd. be rather tasty...I am rather disappointed in our spoil, especially in the horses. There are only four or five worth looking at; I shall try and get one at the auction today... The loot in the way of dresses, cloths, carpets, etc. etc. is not particular... I will try and get something to bring back for your room. The arms are dirty and worthless. So I do not think there will be any amount of prize money." ** Sadly, no white and crimson were to be had, just clasps added to the India General service medal. Dashed bad luck if you ask me.